I work around the corner from the Old Vic theatre. Kevin Spacey and Jeff Goldblum are currently appearing in a play called ‘Speed the plow.’ Today whilst out for lunch with a colleague Kam we passed a man in cycling gear and dark glasses walking a dog. ‘Did you see who that was?’ Kam asked excitedly. Back in the office we told the team about our celebrity spot. ‘You should give him a copy of your book,’ another colleague Nick suggested. I hastily scrawled ‘Hey Kevin – Love your work,’ on the inside cover and handed it to Nick. When he re-appeared sometime later without the book I asked how he’d got on. Unfortunately at this point our lack of ground-work was exposed. Kevin said ‘Thanks…what’s the book about?’ to which Nick replied with ‘Er…smuggling or something,’ before running off. So there you go…not the most flawless of executions…but Kevin Spacey! Keyser Soze himself (for anyone who’s not seen ‘The Usual Suspects’ I have just ruined the twist). 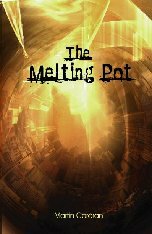 At this moment a copy of The Melting Pot is either residing in the dressing room of a Hollywood A-lister, or else is nestling in a bin somewhere in South London! The site www.guerrillaguru.co.uk has some great ideas for guerrilla marketing – one of which is Blue-jacking i.e. using the bluetooth functionality on mobile phones to send photos to complete strangers within the immediate vicinity. Timing: after work when people are in less of a rush. Location: near books so as to catch the right target audience. It was then that it dawned on me – as bluetooth only has a reach of about 10 metres it would be relatively easy to work out who was sending the messages. A number of people were already giving me suspicious glances. Calmly and with cat-like precision I ran to the toilets and locked myself in one of the cubicles. A few moments later there were footsteps outside and I heard a voice whisper: ‘I think he’s in there.’ A couple of carefully executed grunts seemed to allay suspicion. Either way the best course of action was a swift exit. Back on the ground floor I decided to send just one more. A phone beeped in front of me and a woman stared from her phone directly at me. I had my hands in my pockets, was dressed like a slightly posh burglar and looked as guilty as sin. …Madeley that is. Several months ago I tried to get The Richard & Judy Book Club to review The Melting Pot. My efforts were met with general hostility / disinterest from the forum’s administrator. ‘I’ve got Richard’s phone number,’ she said as a throw-away comment. We were naturally doubtful of this claim and said as much. She reponded by showing us a text message between them – a luvvy-style exchange along the lines of ciao and Bobo. ‘I’ve also got Sally Gunnell,’ she added proudly. Surely this is providence I told myself. The celestial chorus were silenced when she realised I was attempting to get my mojito-addled brain to memorise the number and snatched the phone away. A couple of blogs back I was ranting about how a company called ‘Caiman’ was selling my book online without having any copies. Last week someone found this site whilst googling Caiman. Their listing has since been removed from Amazon! 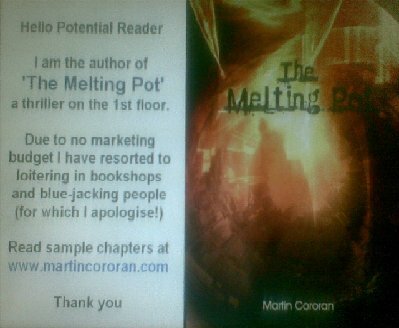 Looking constipated and in pain I made my way across the bar to behold the most surreal site – the members of the group all had copies of The Melting Pot on a small table facing inwards. My first thought was of the Knights of the Round Table and their swords (‘any association with weapons surely can’t be good!’). Mel, the group’s organiser, welcomed me and asked for a brief introduction. I admitted my state of inebriation which drew a laugh (‘maybe they won’t tear me limb from limb after all’). They each took turns to talk about the book and the general consensus was that they loved it! There were also a few criticisms, but mostly questions about how I came up with the plot and characters / stuff they liked. It was such a strange sensation to have people quote stuff that has been rattling around my head for years. There enthusiasm was fantastical and infectious. At 10ish I stumbled out into the night air, extremely grateful to the group for their warm reception and generally euphoric. My amazing-beer-courage had morphed into amazing-beer-hunger-for-junk-food and I embarked upon an even more grueling challenge…finding a cash-point in Hampstead. Back in 2001 I was living in a shared house. One evening I came home to find Pete and (Fat) Martin in the lounge laughing uncontrollably. When I asked what was so funny they were unable to speak and instead passed me a letter addressed to the third house-mate Dan. The previous day Dan had resigned from his job as a security guard after only 36 hours. Embarrassed at the real reason for his departure (laziness / rich parents) he got his sister to ring up on his behalf and say that he’d been involved in a car crash and had, had one of his arms amputated. The groups’ spokesperson took great delight in stating that, ‘we don’t generally read the works of abusive illiterates,’ before declining and wishing me well in my pursuits. Last night, in the middle of a particularly witty anecdote, my sister suddenly shouted, ‘Oo gotta go – Matty needs a pooh,’ and rang off. …Public toilets: a vast untouched wealth of potential marketing where captive (and often drunk) audiences gaze deliriously into space; seeking entertainment, but instead finding uninspiring porcelain. Two of the bars in Reading (where I live) take an interesting approach to urinals – One has a perplex covered photo of route 66 that invites you to see how far up it you can pee; the other features an array of bikini-clad women holding tape measures and meat cleavers whilst laughing maniacally and pointing down at your sorry genitalia. Why not place laminated adverts there (I hear you cry). I ran this idea past a work colleague who offered to lend me his personal laminator. ‘Who on earth buys a laminator for their own personal use?’ I demanded to know somewhat ungratefully. The person in question went bright red, prompting my mind to conjure all kinds of hitherto unthought of deviances. Random aside: Cheers to Simon at ‘Cape Town Capers’ for adding me to his blog roll – by far the tallest Stella-drinking .net developer I’ve ever met, and no doubt ecstatic about being mentioned at the end of a passage concerning bodily functions!